An interesting fact emerged in "the other controversy" at Monaco - Davidson's drive-through penalty for ignoring blue flags when Massa was running behind him. This sparked a surprising amount of debate amongst F1 enthusiasts and it became clear that a lot more people are watching the Super Aguri team than might have been expected. If any team has "Minardi cool" at the moment, it seems that it is the Japanese minnow. More than anything else, this stems from the fact that SA have been beating their parent team, Honda, in the early part of the season. We do love to see the little guy making a fool of the giant, after all. And, even though the tables appear to be turning as Honda gets its act together, this effect will have earned SA many fans who will stick with them through the year. Hence the way support rushed to Davidson's defense when he pointed out the unfairness of his penalty at Monaco. When you add to this the way Davidson was passed illegally, without penalty, by Sato and the two Spykers at the start of the race, as pointed out by F1 Fanatic, it has to be said that he was hard done by indeed. That Davidson was heard at all in the clamor arising from the McLaren team orders scandal is pretty amazing, even so. Hamilton had his hearing in the British press but Davidson was at least able to gain the ear of the F1 enthusiasts - they knew that the charge against McLaren was ridiculous and unworthy of investigation. And, now that Davidson has risen above the horizon of our notice, what can we say about his achievements in F1 so far? To be honest, he has not been spectacular in the races to date. Teamed with the mercurial Takuma Sato, he has looked competent, able to stay with his team leader, but unlikely to beat him. However, in a Super Aguri press release interview with Davidson's race engineer, Antonio Cuquerella, it becomes clear that SA understand that it takes time for a test driver to adjust to the increased demands of competing in F1. It is expected that Davidson will get better and better as the season progresses. If that is so, he will be finishing ahead of Sato before long. 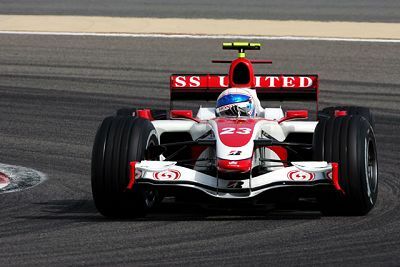 In previous races, Davidson has run at the same pace as the Japanese driver and it has been only bad luck or a lack of experience that has kept him back. When we remember those stirring drives of Sato's in his early days in F1, when it appeared he would either overtake the car in front or spin off into the kitty litter, we have to admit that Davidson has potential indeed. Sato is the quickest Japanese F1 driver to date (and there have been some good ones); if Davidson is even faster, that means he must have what it takes. Super Aguri fully deserve the support they are winning for themselves and the fascinating competition between their drivers should gather them even more fans. They have not won me over completely yet but I do admit to a sneaky "Go, Anthony, go!" on occasion.